An associate of WikiLeaks founder Julian Assange has been arrested in Ecuador while trying to leave the country. Ecuador's interior minister Maria Paula Romo said the man was preparing to travel to Japan, but she did not name him. She told a local radio station that the man was very close to Assange, who was arrested inside Ecuador’s embassy in London yesterday on a US extradition request after spending seven years there. Earlier, the minister had linked the man with alleged attempts to destabilise the government of Ecuadorian president Lenin Moreno. She said: "He has been detained simply for investigation purposes," adding that he had taken foreign trips with former Ecuadorian foreign minister Ricardo Patino, who gave political asylum to Assange in 2012. Ms Romo said: "We have sufficient evidence that he was collaborating in attempts to destabilise the government." London Metropolitan Police moved in after Ecuador withdrew its asylum for Assange and cancelled his citizenship, granted in 2012. He had been living in the embassy, fearing arrest, but the Ecuadorian government said he had "repeatedly violated" the conditions of his protection. US officials announced after his arrest that he had been charged with conspiracy to commit computer intrusion, paving the way for his extradition. 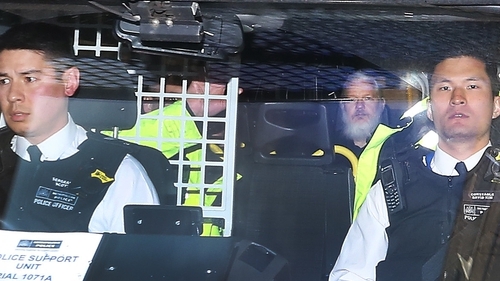 Assange gave a thumbs up in handcuffs as he was taken from a police station to a London court yesterday afternoon, where he pronounced himself not guilty of failing to surrender in 2012. District judge Michael Snow called Assange a "narcissist" and convicted him of skipping bail. The US Justice Department said Assange was charged with conspiring with former army intelligence analyst Chelsea Manning to gain access to a government computer as part of a 2010 leak by WikiLeaks of hundreds of thousands of US military reports about the wars in Afghanistan and Iraq and US diplomatic communications. The indictment was made secretly last year and unsealed yesterday. He faces up to five years in prison if convicted, with legal experts saying more charges were possible. President Donald Trump, who in 2016 said "I love WikiLeaks" after the website released emails that US authorities have said were hacked by Russia to harm his election opponent Hillary Clinton, told reporters he had no opinion on the charges against Assange. Following Julian Assange's arrest, former Home Secretary Lord Blunkett said people giving the WikiLeaks founder "unqualified support" were being "extremely unwise".